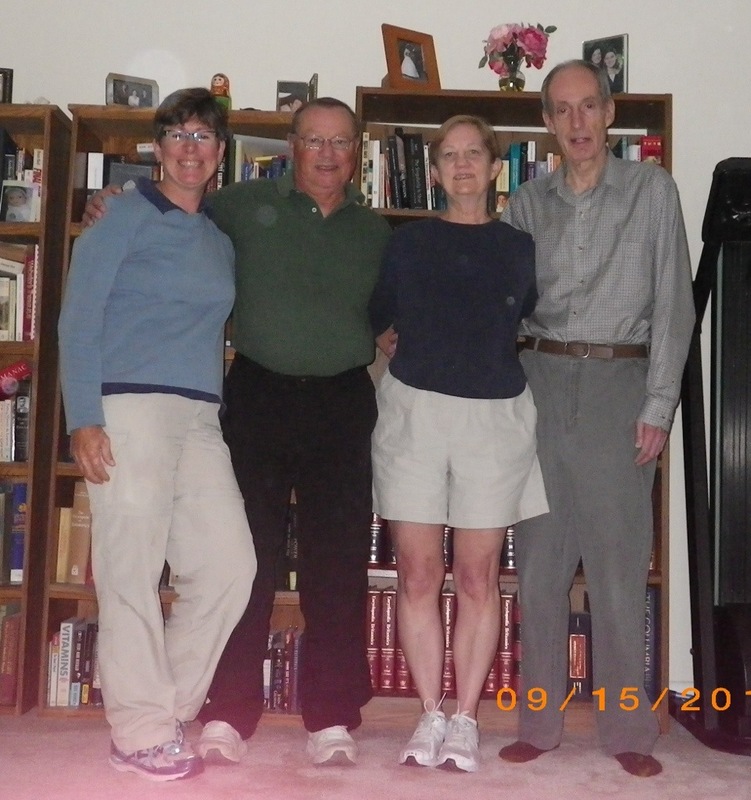 Today we are going to Arlington, VA to visit Phil’s cousins Karen and Jerry. We woke early at 6am and left the boat at 645am to walk a little over a mile to the Bus stop. When we got there, the 160 express bus just arrived and not knowing if we should take it, we waited for the 23 bus, which turned out had 83 stops. 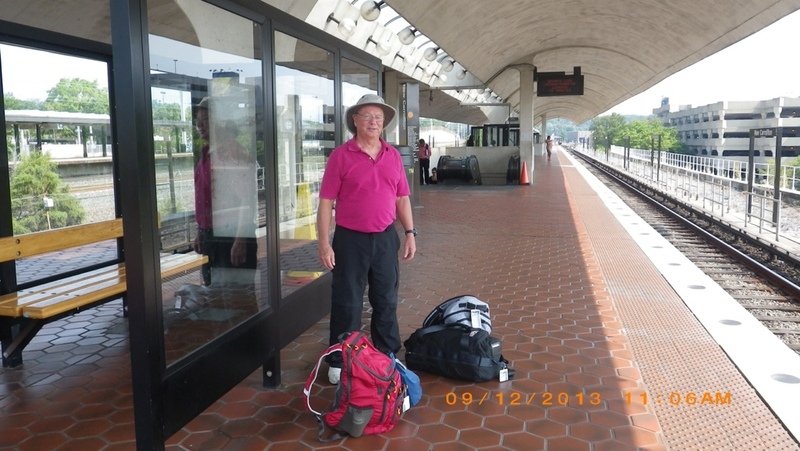 Phil thought that it took us to Camben Station to catch the MARC train to Washington D.C. Union Station, but it wasn’t until we were downtown that we found out that we needed to get off and catch another Bus which one unknown to us. Looking at the map on our iPad, we decided to hoof the approximately 1 mile to Camden Station going through some not nice areas. We made it there at 9am 1 hour after the last rush hour train. Fortunately they had a lite rail shuttle train that took us to Penn Station and there we were able to get the MARC train for $7/person to Washington. We could have caught some Amtrak trains, but they were much more expensive. Here we are waiting for the train at Penn Station with our backpacks and the duffle bag we shared carrying. What you can’t see is my shoes, white Privos, instead of my tennis shoes which was the wrong decision as I strained my left foot walking 2+ miles in them. 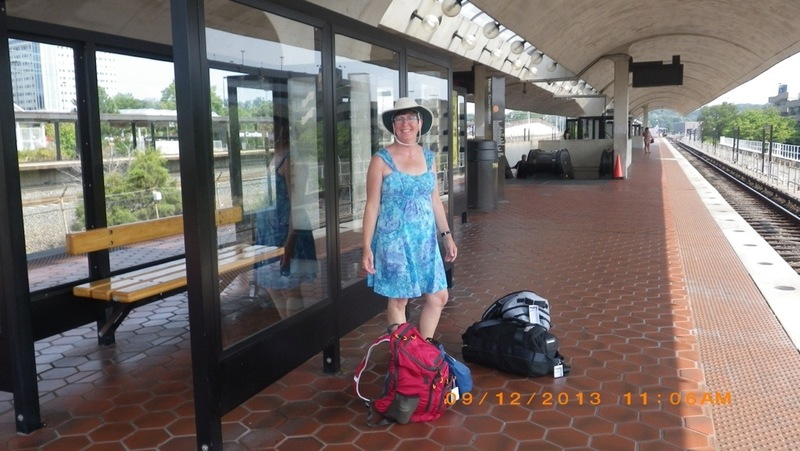 Once there, we took the Metro Subway to Ballston stop and Karen met us there for the 2 block walk to her apartment. We were tired arriving about 2pm. 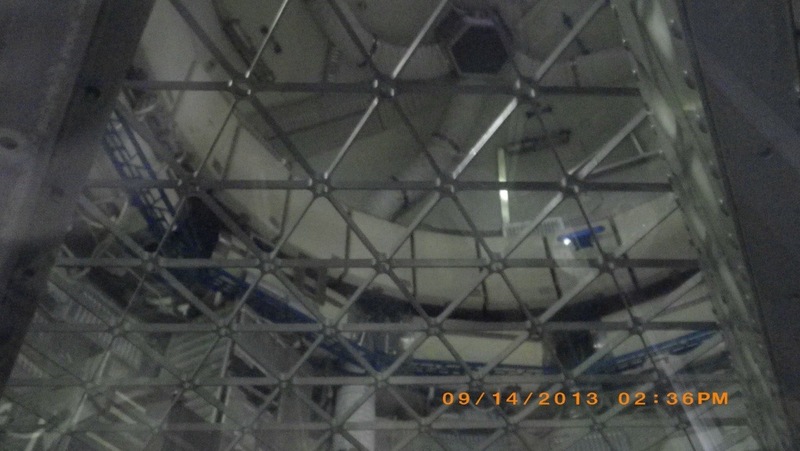 This is inside the Metro. 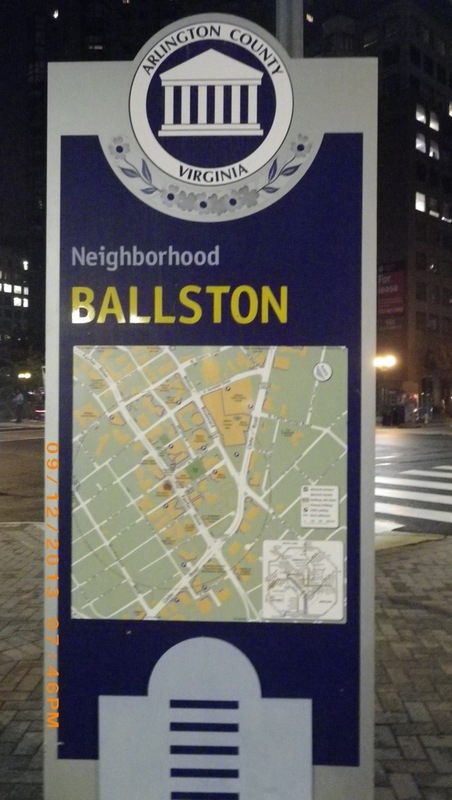 The area of Arlington where they live. Shortly after we got settled, we went across the street for some lunch at a restaurant that had a buffet with high quality food then Karen and I walked to the mall and grocery store. Back at her apartment, we talked and got caught up while waiting for Jerry to get home from work. Karen doesn’t cook that much so we went out to dinner every evening: tonight to a Thai restaurant. They had very good food. After breakfast, Phil helped Karen get her internet connected to her new computer and got the wifi network in her place working. Karen has just retired and bought an iPad mini, but needed wifi to get it working. We started setting up her iPad, but then left to go sightseeeing while she decided her username and password. 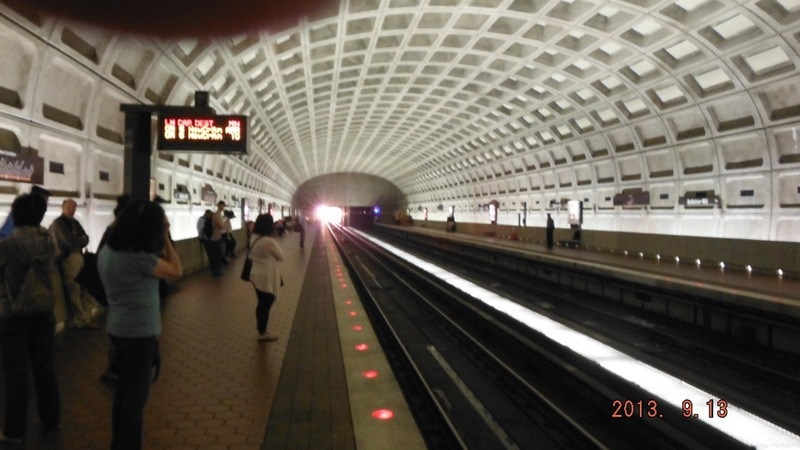 We took the Orange line on the Metro to Foggy Bottom stop and walked down 23rd street. My foot was hurting quite a bit, so when we saw a bike rental place we stopped and got us 2 pretty red bikes. 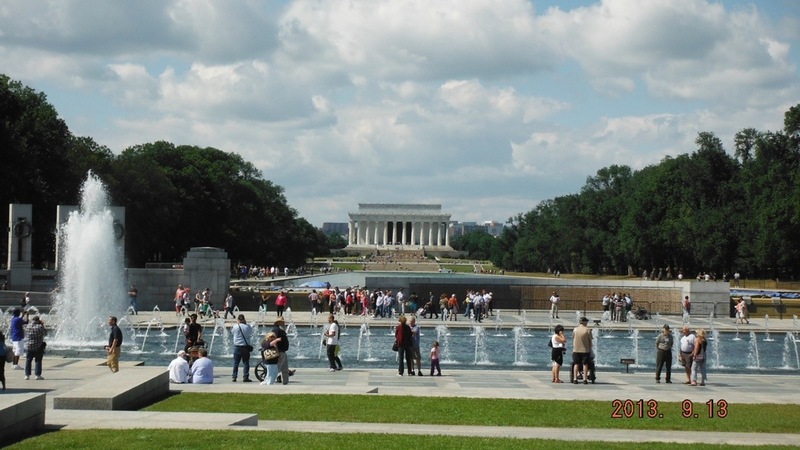 This was definately the way to go visiting the Lincoln Memorial first. 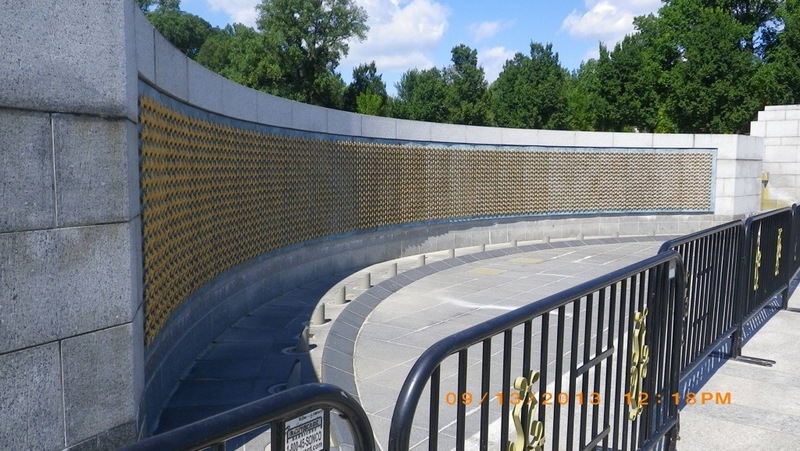 View from WWII Memorial down the Mall. 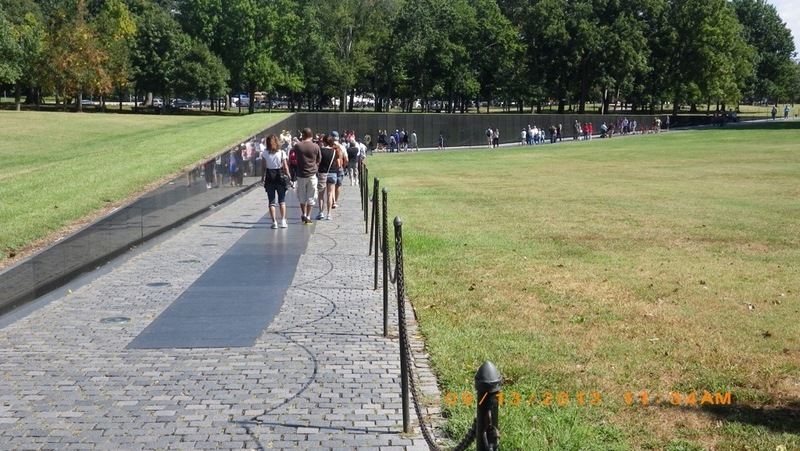 Then the Vietnam Memorial, which we hadn’t had the opportunity to see since it was built. 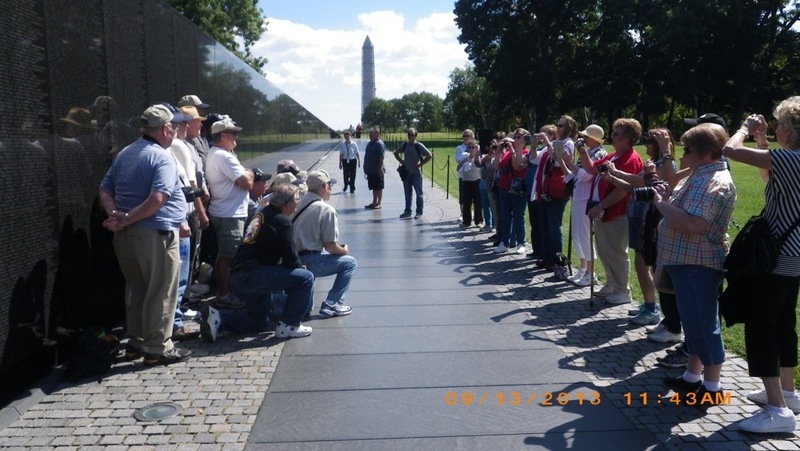 There were a couple groups of Veterans visiting, one with wives taking photos. 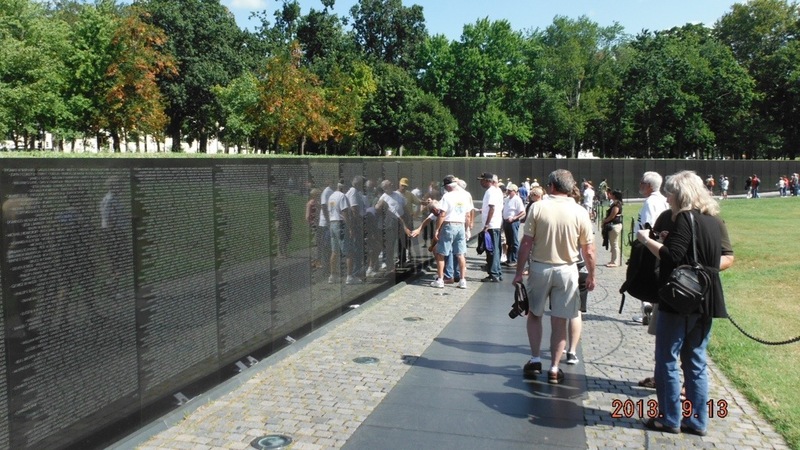 It’s a moving memorial and a volunteer told us how the names were inscribed on the wall and the meaning to the order in which it was done. 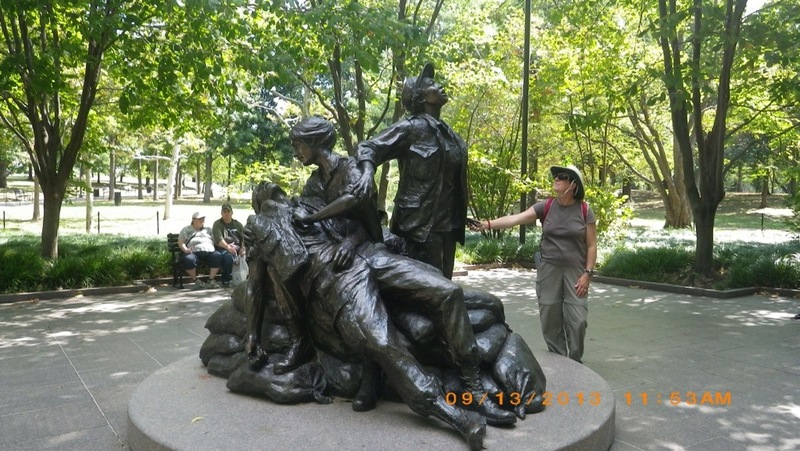 We visited the Vietnam Nurses Memorial. I can’t help but think of the TV show “China Beach” in the 1980’s. 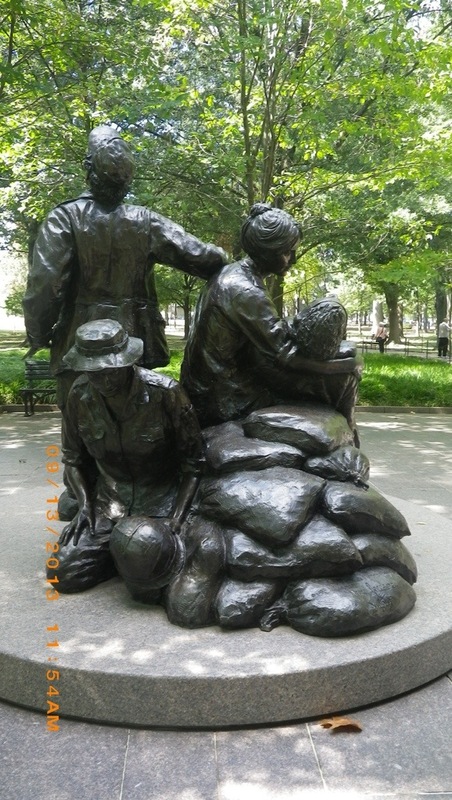 I know the nurses went through their own kind of hell caring for the injured soldiers. 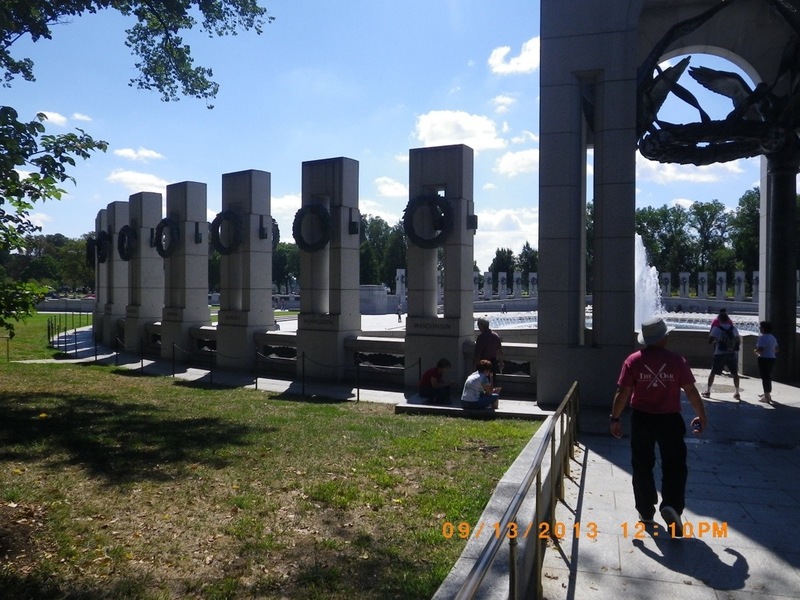 We continued on riding our bikes down the Mall to see the World War II memorial which is huge! 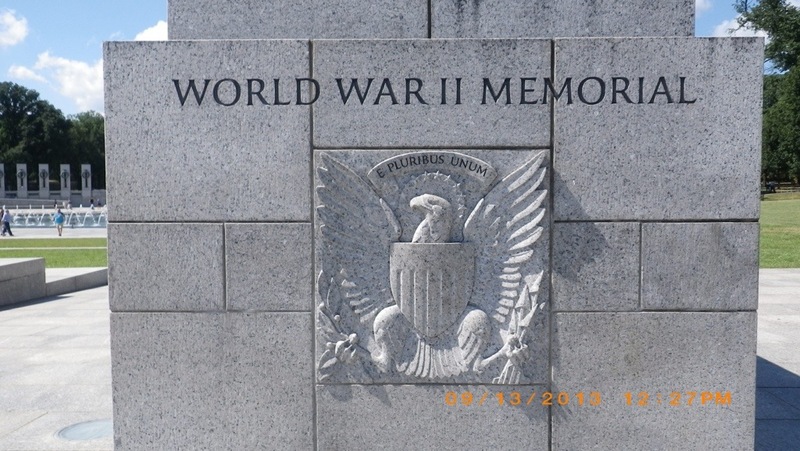 They talk about the Atlantic Theater and the Pacific Theater of the war, have 3D murals and a water fountain. 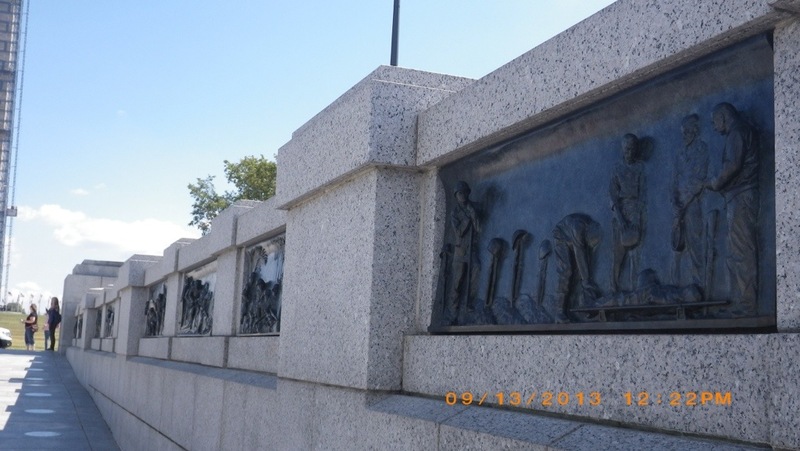 Around the fountain, they have the states and territories that participated in the fight. 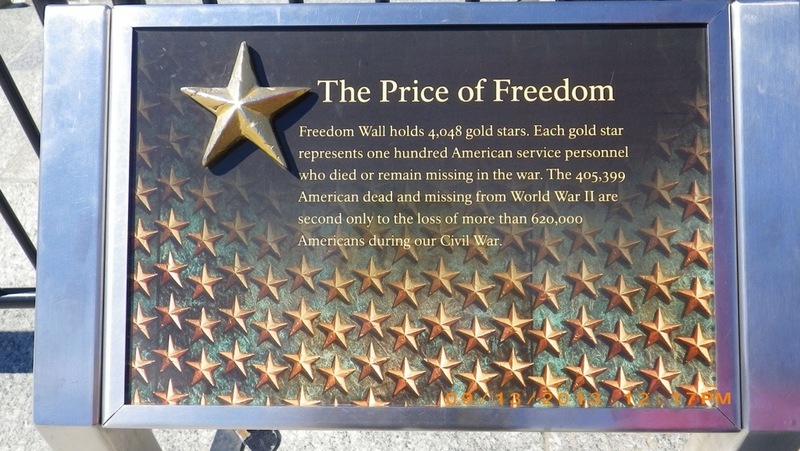 The wall of stars is pretty sobering when you think about the cost of war in human life for WWII and for the Civil War which is mentioned in the explanation of the exhibit. 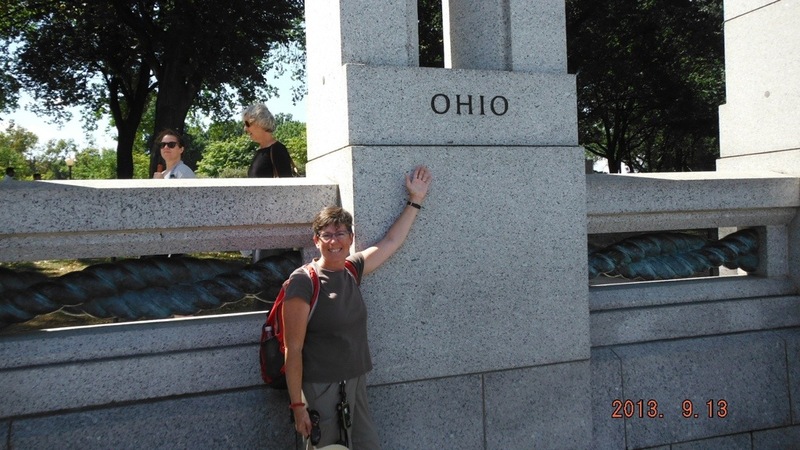 Here is Lorraine pointing out our home state of Ohio. Then we rode to the American History Museum which was very good and smaller than a lot of the museums. 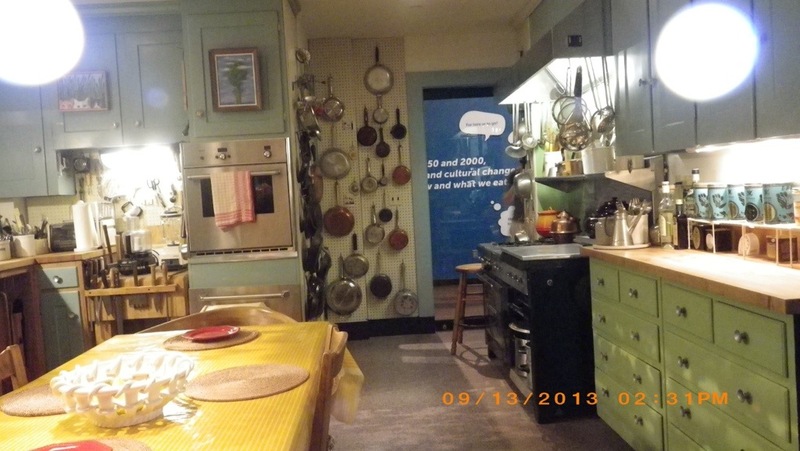 I was able to see Julia Child’s kitchen which she had donated. There were also exhibits about money, trains and other transportation, The Golden Books for children. Phil saw the Transportation Exhibit about ships from the beginning sailing ships to modern cargo ships while I saw the Food Exhibit. We were museum out so didn’t see all the exhibits. 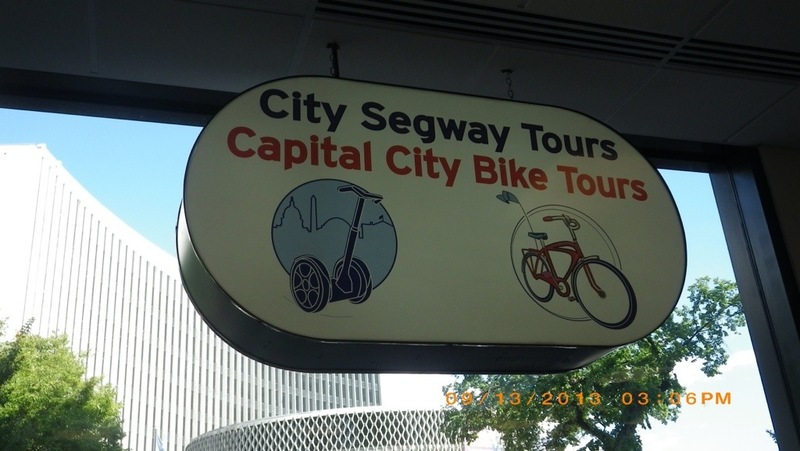 Having enough site seeing for a day, we rode the bikes back and turned them in. Even without by bum foot, riding bikes was the right way to go. Back at the apartment, we found that Karen was successful in getting her iPad up and running while we were gone; Now for a tutorial for the basics. After Jerry got home, we walked to Radio Shack to buy a blue ray player with wifi so that we could get them able to stream movies through the internet on their TV. We went out to eat at a Japanese restaurant. Karen ordered a seafood rice bowl and when it came to the table, I notice there was something moving on top. WHAT! The waitress said there was some dried fish and the heat makes it move. That turned off Karen’s appetite so she shared our food, which was fine as there was plenty! I guess they have authentic food here. Walking home, we watch the movie “Tin Man” with Danny Divito and Richard Dreyfus. We took Karen out to IHOP for breakfast (Jerry went to work already) as they have one right around the block. 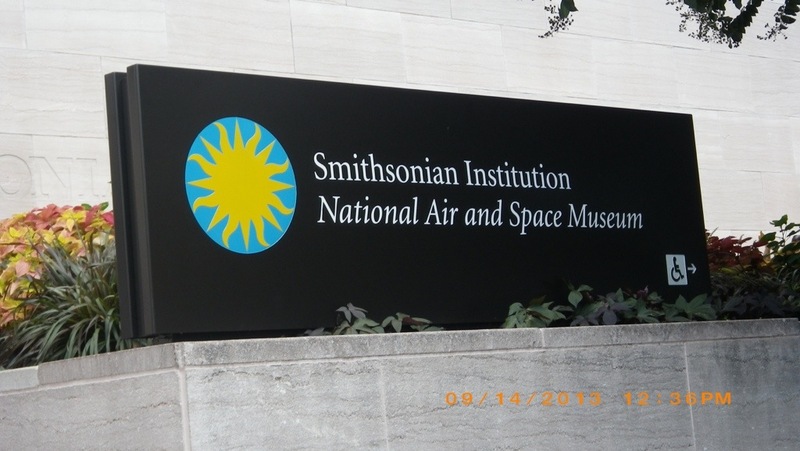 Then Phil and I took the Metro getting off at the L’Enfant Plaza station to go to the Air and Space Museum and the American Indian Museum if we had enough time. Turned out that we were able to see only one museum. 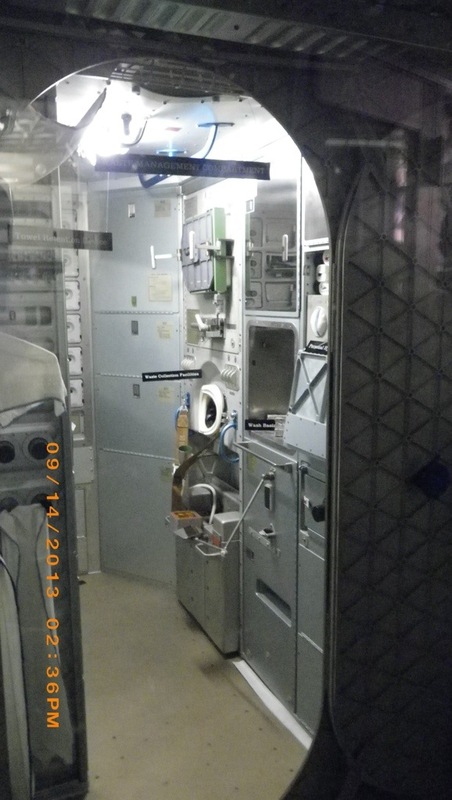 Since I was last here when I was a child, there are many more exhibits about space that has been added as you can expect as in 1969 the big event was landing on the moon and so much more has happened in our space expeditions. 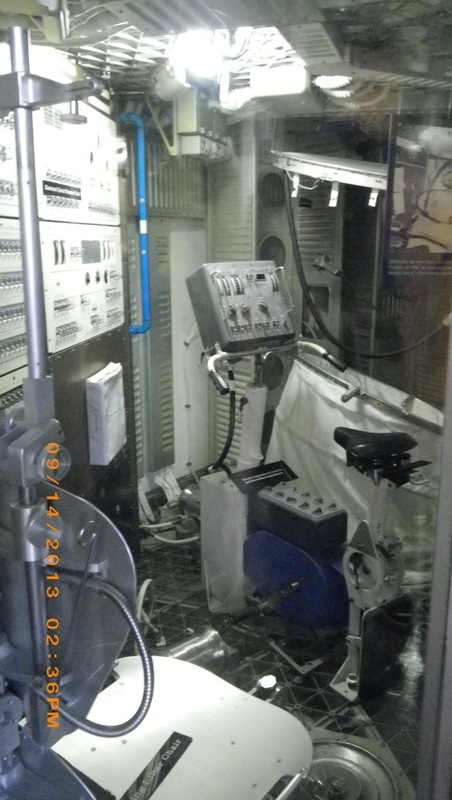 There were ALOT of exhibits from the Wright Brothers to Charles Lindbergh and the original Spirit of St. Louis plane to modern planes and nuclear missiles. There was a exhibit about Navigation through the ages and early plane engines which Phil enjoyed and many more then we discuss. 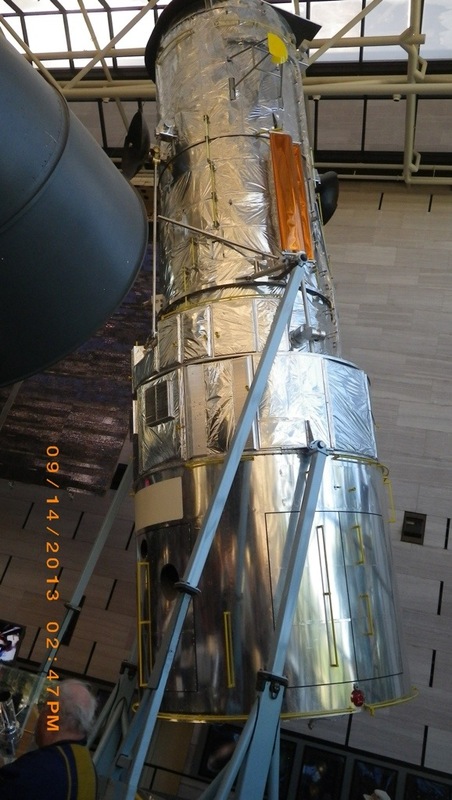 We have too many photos to show here but it was a good museum to visit. 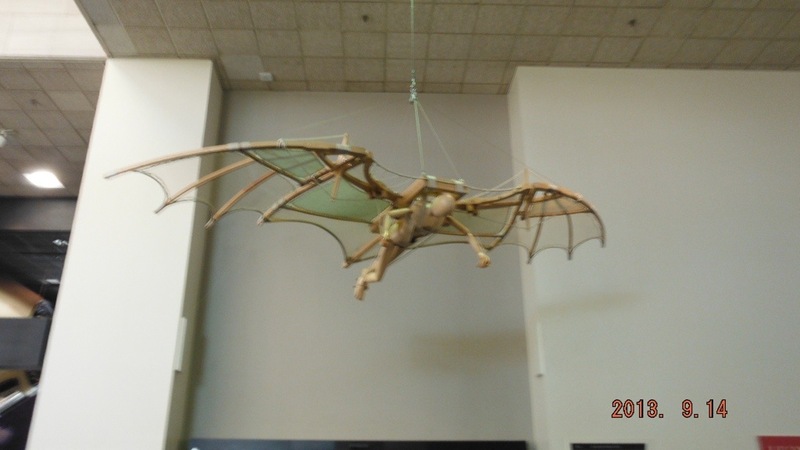 One of the temporary exhibits was Leonardo Divinci and his flying bird. 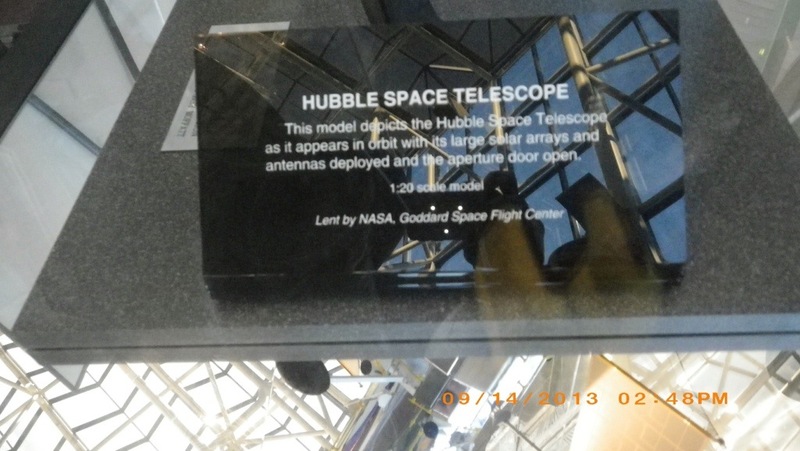 We saw the Hubble Telescope and found there is a web site that has a gallery of photos taken of the galaxies. 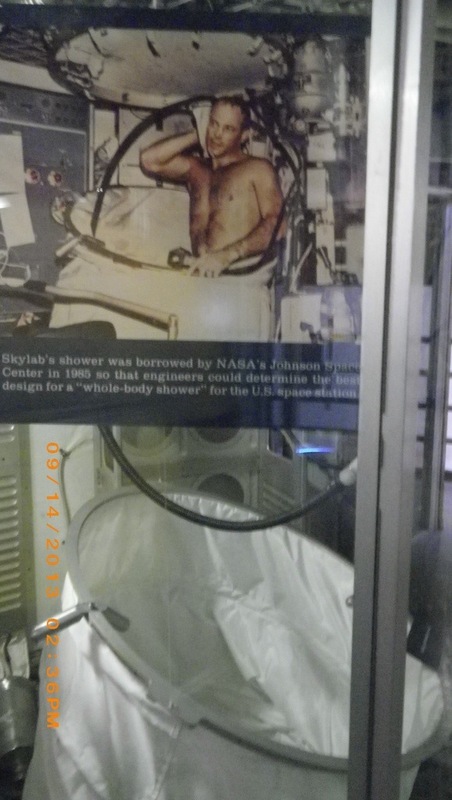 One exhibit that was very interesting was the Skylab Space Station which we could walk through and did. This is the bathroom area. 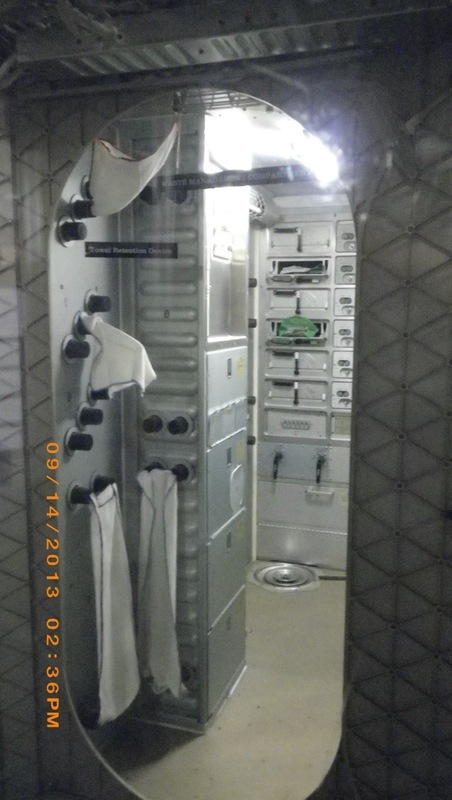 Towels held in place and then the bathroom area. We thought we had it bad taking a shower on a boat. Look at their facilities. They said that the living area was the size of a small house. Could have fooled me. But look at the size space I’m living in now! At least we can get off easily with our dinghy. For lunch we sat outside on a retaining wall for raised bed in the shade then went inside again. Yesterday we had hotdogs and chips with 2 drinks for $18. No thanks for that today! About 330pm, we had had enough and started walking back to the Metro Station. We had a hard time finding the station and came up to a couple to ask them. 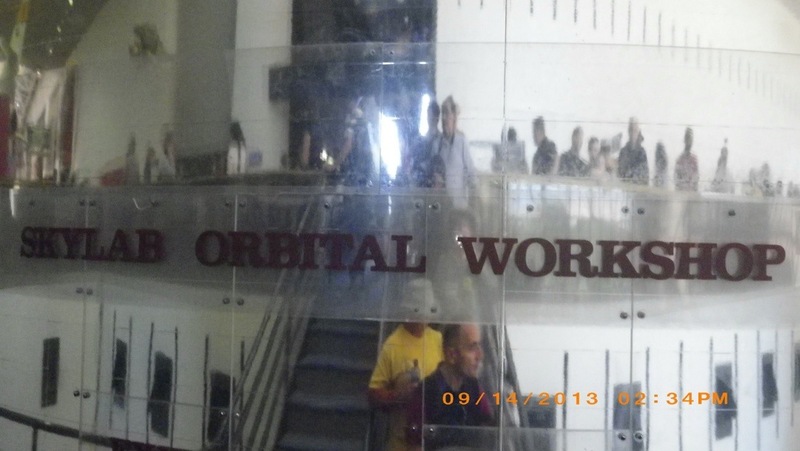 They said that the doors were closed here, so we followed THEM being from this area to find the other entrance. This stop was a Transfer Station so there were more than one. Good thing that we followed them, as we would have had a very difficult time finding it ourselves having to go inside a building and around a corner to get to it. Once on though we had no problems and got home before 430 pm. We decided to stay in today and had pizza and salads for supper and set up to new Blue Ray Player. It took some time and Phil and Jerry had to walk to the mall to get the HDMI cable. 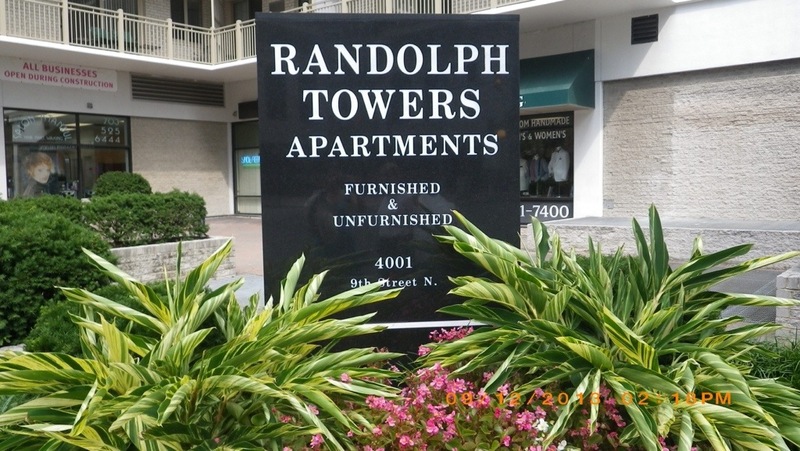 Finally after it being set up, we tried to find a movie to watch on TV, but decided to watch a Doris Day, Rock Hudson, & Tony Randall movie instead which was light & enjoyable. Then Phil and Karen found a Bruce Springsteen concert on You Tube via the blue ray player so of course we had to watch that as Bruce is King. 🙂 Needless to say it was a late night. Today is the day to return back to Middle River in Essex so that we can take advantage of the north winds predicted to arrive tomorrow so hopefully we can sail part way to our next destination. After breakfast and photos, we left about 1030am to walk to the Metro to start our journey home. This time I had copied and pasted our itinerary on the iPad so could refer to it to make sure we got on the right bus/train at the right time to get home. There aren’t as many choices on a Sunday, so want to make sure if we miss something, we can still get home. All our transfers went smoothly arriving at Washington Union Station without mishap catching the NE Cooridor Amtrak train and arriving in Penn Station on time. We had a long wait in the sun and gave the 11 bus 5 more minutes, catching it 1 min before we had decided to leave to get a taxi. We were lucky that we didn’t have to walk to transfer to the 23 bus and it was about 5 min behind the 11 bus. 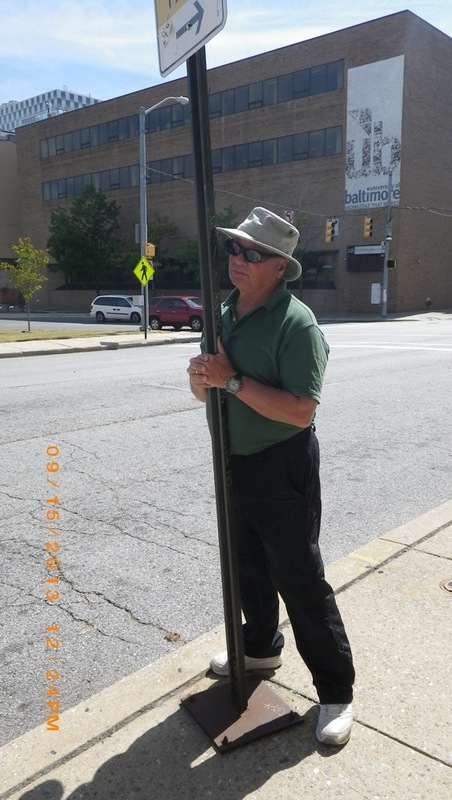 Without mishaps, we arrived at our bus stop and walked the 1+mile home to arrive about a little after 2pm to find Changes safe and sound and the MRYC members out on the bar deck watching the Ravens and Browns football game. I wish that I could say that we kept our lead and won, but that wasn’t to be the case. While on this trip, I had been knitting Heather a pair of socks, so being almost finished I wanted to try them on her and give them to her. We invited her over to have dinner with us at the Steelfish Grill also so we could see her one last time before we left tomorrow. We had a very good dinner. Oh – the socks were WAY too big, so I will rip them out and try again though she was glad to have them anyway. After a quick trip to the grocery store to get fresh food we said our goodbyes. It was great to see our families and we thank them for all that they did for us! 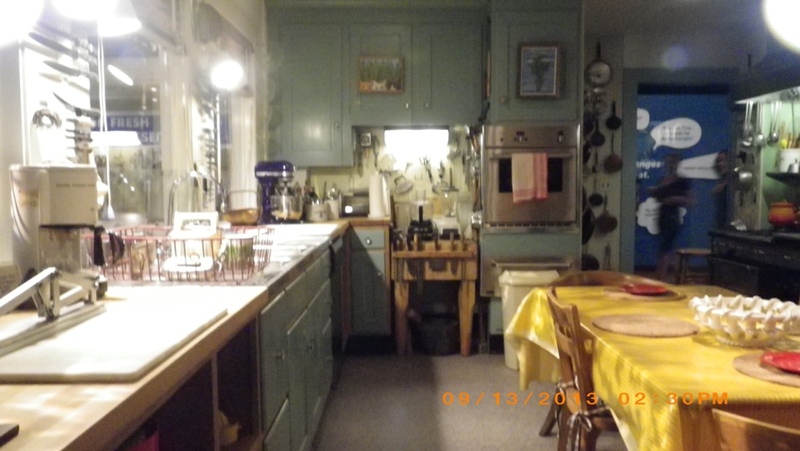 This entry was posted in 2013, Family, Knitting, Lorraine's Projects, Places Seen, United States, Virginia, Washington D.C. and tagged bus, Family, train. Bookmark the permalink.